The Lysekils Sändareamatörer club SK6IF is located some 100 km north of Gothenburg, in Lysekil, a small town on the tip of a peninsula in the very best part of the wonderful Swedish west coast archipelago. The club was founded in the early 70´s and today we count 33 members, which is more than ever before. Most of us are quite active on the bands and other club activities. Our dedicated team works continuously to strengthen our efforts to make the ham radio hobby pleasant and full of joy. We are now at excellent and spacious premises with an up-to-date radio shack and an antenna tower. 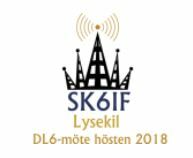 We also run the contest call SK6L at a great low noise QTH, on a high level, close to the sea. Please feel free to give us a call and drop in on your next visit in the vicinity. SK6IF runs three repeaters. On 145.600 MHz (RV48), on 434.800 MHz (RU384) and DV on 145.575 (RV46) or you can try to call us on 145.500. The two analouge repeaters are working simultaneously with -0.6 MHz and -2.0 MHz split respectively and they can be opened by a 118,8 Hz subtone. The DV repeater uses the common D-Star technology on DCS 1010 I with -.06 MHz split.